Salt + Light has a new comedy web series! Introducing Salt + Light’s new comedy web series: I’VE GOT A QUESTION FOR YOU. In this quirky, light-hearted series, Salt + Light staff members explore issues relevant to Catholics today – sometimes in unexpected ways! "The original idea was to give people a look behind the scenes at some of the personalities of Salt + Light," said producer Noel Ocol, one of the creators of the series. "We have so many conversations at our desks and during lunch, and it just struck me that these are the kinds of conversations that real Catholics have but we don't really get to talk about on TV. So I brought Kristina and Allyson on board, and somehow this came out. And I have to give a lot of credit also to Peter, who does our editing. There's so much that happens in post-production even on a short piece like this." 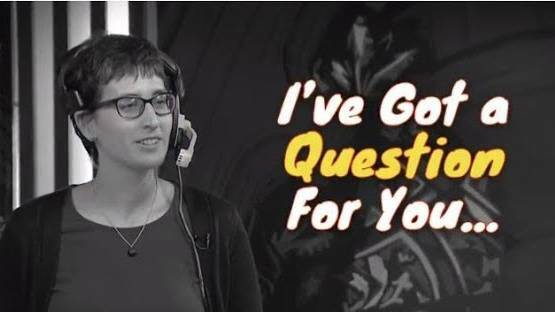 I'VE GOT A QUESTION FOR YOU is mainly intended as a web series, airing on S+L's website and on our YouTube channel, but it will also appear on television in the small spaces between our regular programming. In our first episode, Noel gives Allyson some interesting dating advice. To watch the episode, click on the video above or go to YouTube.